Welcome to the New Hampshire State Bookstore. We're glad you stopped by and we hope that you find exactly what you're looking for. Shopping categories include books about New Hampshire people, books about New Hampshire History, New Hampshire Cookbooks, Hiking and enjoying the New Hampshire outdoors, New Hampshire reference books, and calendars, magazines and newspapers, DVD and videos, and posters under MORE. In The New Hampshire State Bookstore you will find information about New Hampshire for readers of all ages. Age ranges for books for young readers are highlighted in red. Have fun. 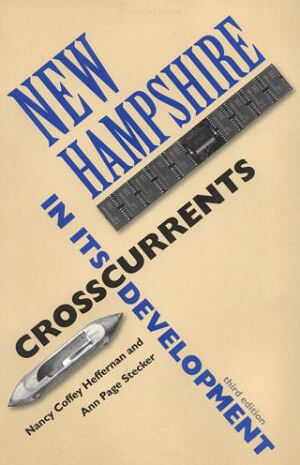 New Hampshire, Crosscurrents in Its Development , by Nancy Coffee Heffernan and Ann Page Stecker. 238 pages. UPNE; 3 edition (July 1, 2004) From fiercely ambitious and independent colonial towns to the first-in-the-nation presidential primary, this highly readable book traces the colorful political and economic crosscurrents of New Hampshire's history. This highly readable book is for people who want to know the history of New Hampshire and like to be entertained while they are informed. Originally published in 1986, this book tells the story of the development of New Hampshire beginning with the first European settlements. The authors include sketches of early fishing and lumbering traders, the railroad's impact from 1840 to 1870, adventurous mill girls, Progressivism, and the death of influential conservative publisher William Loeb in 1981. The 1996 edition contained a new chapter on the growing impact of the state's first-in-the-nation primary and the Clinton/Gingrich visit to Claremont in 1995, and discussions of how burgeoning development in the 1980s forced once manageable towns and small cities to create zoning ordinances to make way for condominiums, malls, and industrial parks. This new, updated edition addresses such topics as the Claremont school funding case; the impeachment of Justice Brock and the U.S. Supreme Court appointment of David Souter; and especially the boom and bust of the '90s and early '00s, including discussion of such major industries as Tyco and Cabletron and their role in the state's economy. The book includes a time-line of important events and an updated bibliographical essay. A classic history of New Hampshire's economic and political development, now updated for the twenty-first century.